Paris and London are multiplying their categorical declarations against Daesh, its programme of ethnic cleansing and its terrorist attacks. And yet they are preparing in secret for the ethnic cleansing of Northern Syria with a view to creating a pseudo-Kurdistan, and the re-localisation of Daesh to Al-Anbar in order to create a « Sunnistan » there. Thierry Meyssan analyses this plan, and underlines the numerous contradictions in the official discourse. Is the military intervention by France, Israël and the United Kingdom in Syria legal ? On the 20th November, in order to launch their new war in Iraq and Syria, France, Israël and the United Kingdom forced the Security Council to adopt resolution 2249 . In the opinion of the French representative at the UNO, who is the author of the text, the resolution authorises collective action in accordance with article 51 of the United Nations Charter, in other words, as a means of « legitimate defence ». For the British Prime Minister, David Cameron, it supports « any action against this murderous and diabolical sect, both in Iraq and Syria » . However, according to the experts of the Research Service of the Library of the House of Commons, this is entirely false. After a careful study of the legislation concerned, Arabella Lang states that the resolution in no way authorises the use of force, but enjoins everyone who has the legal possibility to do so to redouble their efforts . This means that the resolution only applies to states which have been requested to intervene by Iraq and Syria. For the purposes of the cause, Iraq therefore addressed a letter to the General Secretary and the Security Council confirming that they were under attack by Daesh from Syrian territory, even though the Islamic Emirate was founded in Iraq. Since France and the United Kingdom had been solicited by Iraq, the two states – excluding Israël - pretend that they are exercising their right to « legitimate collective defence ». Besides this, each of them pretend that they have been attacked by Daesh from Syria, and therefore claim they also have an individual right to legitimate defence. Unfortunately, these arguments are only valid if Paris and London can provide proof that Daesh is preparing imminent attacks from Syria, which is not the case . Consequently, military intervention in Syria by France, Israël and the United Kingdom remains illegal in the absence of prior agreement from the governement of the Syrian Arab Republic. Let us remember that the United Nations Charter and the pertinent resolutions of the General Assembly formally prohibit military support for non-state groups seeking to overthrow members of the UNO. This is why France and the United Kingdom have long been pretending that they were sending only defensive equipment to the armed groups in Syria. Unfortunately, these groups also receive large quantitites of offensive weaponry – notably rifles, mortars, anti-tank and ground-to-air missiles, explosives, and even combat gases. In August 2014, French President Hollande admitted, in an interview with Le Monde , that he had delivered offensive weapons to the Syrian « rebels » . He later specified, in interviews with journalist Xavier Panon, that he has been delivering  20 mm cannons, machine guns, rocket-launchers, and anti-tank missiles since 2012, which unambiguously violates international law, and drags France down to the level of a « gangster state » . Since the 20th November, France has been attempting to form a coalition – yet another – to fight Daesh, and more specifically, to take Rakka. This rhetoric, which is all it takes to convince the French population of their government’s determination to respond to the 13th November attacks in Paris, is nonetheless a poor disguise for the colonial intentions of President Hollande. Indeed, chasing Daesh out of Rakka is all well and good, but with which ground troops and to whose profit ? The Russian aerial campaign is lending support on the ground to the Syrian Arab Army, while according to the French Minister for Foreign Affairs, Laurent Fabius, the Franco-British campaign could support the Free Syrian Army (organised by the members of Al-Qaïda in Libya), the Sunni Arab Forces (in other terms, the Turkmen mililias supported by the Turkish Army), and the Kurds (both the Syrian YPG and the Peshmergas of the Regional Kurdish Government of Iraq). In case these forces should manage to take Rakka, the city would be handed over to the Regional Kurdish Government of Iraq, who would annex it. 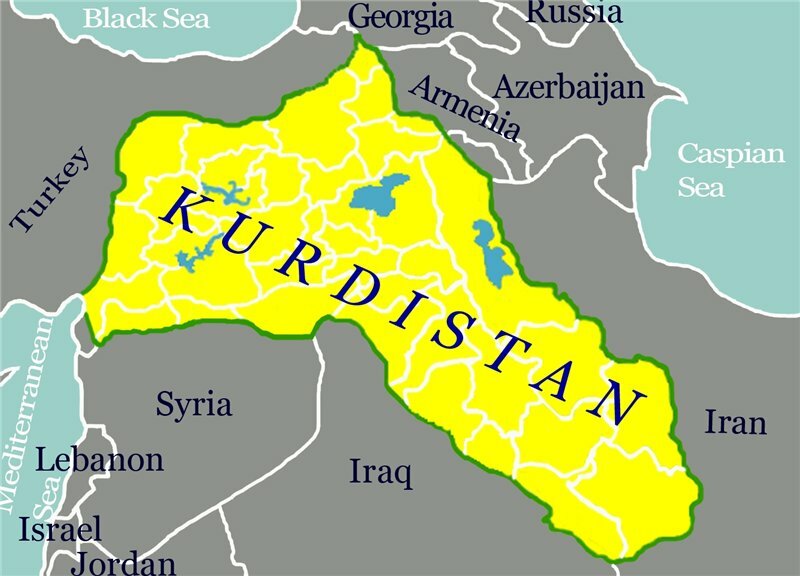 The goal is to proclaim a « Kurdistan » straddling the border between Iraq and Syria, and then expel the Syrian populations who live there, followed by the transfer of 10 million Turkish Kurds to this new state. In 2011, Alain Juppé (France) and Ahmet Davutoğlu (Turkey) came to a secret agreement to employ a terrorist organisation (Daesh) to force the creation of a Sunni state and a Kurdistan, both straddling Iraq and Syria. Their project was supported by Israël and the United Kingdom. In 2011, Alain Juppé, then French Minister for Foreign Affairs, and his Turkish counterpart, Ahmet Davutoğlu, signed a secret treaty. We know that it included several reciprocal engagements, including that of « resolving the Kurdish question » without « damaging the integrity of Turkish territory », in other words, the creation of a pseudo-Kurdistan in Syria. Still convinced that he is a Gaullist, the French have apparently not noticed his about-turn in 2005. At that time, he had been condemned to a suspended 14-month sentence and one year of ineligibility for having financed his political party by the misappropriation of public funds. He left France and went to teach in Montreal. However, he was present in Canada only infrequently, and followed a training course in a third country. Today, although he is a member of the opposition, he is one of the main inspirers of France’s Near-Eastern policies, which President Hollande continues to implement in comtempt of History and the interests of France. The Kurds are a people who for several centuries have lived in a territory which is shared today between Turkey, Iraq and Iran. The 1962 census revealed that there were only 169,000 Kurds in Syria, which is an infinitesimal portion of the general population. But during the Turkish civil war of 1980-90, 2 million Turkish Kurds took refuge in Syria. The idea of France, Israël and the United Kingdom is to carve them out a state, not in their true home in Turkey, but by colonising the country which has generously sheltered them. Syria had already been divided by France and the United Kingdom during the San Remo Conference (1920) according to the terms of the Sykes-Picot Agreement (1916). Historically, it included not only the present Syria, but also Palestine, Israël, Lebanon, Jordan, Sanjak of Alexandretta (Turkish Antioch), and part of Iraq. The current project thus aims to continue this dismemberment. The representative of the Syrian Kurds, Salih Muslim, was received in Paris on the 31st October 2014 by François Hollande and Recep Tayyip Erdoğan. The three men agreed to create a pseudo-Kurdistan in Syria from which they would expel the Sunni and Christian population, and to which they would transfer the Syrian Kurds. The Kurds form a single culture, but speak different dialects – Kurmanji (northern Syria), Sorani (Iraq and Iran) and Pehlwani, (eastern Iran and western Iraq), to which we must add a fourth and totally different language from the former three, the Zaza-Gorani dialects (north-western Iran). During the Cold War, the Kurds divided into two distinct groups, the first of which was supported by Israël and the United States, while the second was supported by Syria and the USSR. During the Turkish civil war, the PKK, the main Kurdish party (of Marxist-Leninist obedience) and its chief Abdullah Öcallan, were militantly in favour of the creation of an independent Kurdistan in Turkey. They specified that they had no territorial ambition in Syria. Öcallan was welcomed as a political refugee in Damascus, from where he directed military operations in Turkey. Fleeing the repression, 2 million Kurds found refuge in Syria. But in 1998, Ankara threatened Damascus with war if it continued to shelter the PKK. President Hafez el-Assad finally asked Abdullah Öcallan to find another refuge, and continued to protect the Kurdish refugees. At the start of the war against Syria, President Bachar el-Assad gave Syrian nationality to many of the Kurdish refugees from Turkey. He encouraged them to create local militias, and to participate in the defence of the territory. During the first two years of the war, their co-operation with the Syrian Security Forces was total, but in 2014, the situation began to deteriorate. On the 31st October 2014, Salih Muslim, the director of the Kurdish Democratic Union of Syria, was received by François Hollande in annex to an interview with the Turkish President, Recep Tayyip Erdoğan, just after the battle of Kobani. The two heads of state, who until then had refused to help the Syrian Kurds, managed to convince Salih Muslim that he would have a personal interest in betraying the engagements of the PKK and joining their project. One year later, Salih Muslim launched an operation consisting of the forced « Kurdisation » of Northen Syria, which provoked the uprising of the local populations, mainly Assyrian Christians and Sunni Arabs . However, when France, Israël and the United Kingdom launched the operation of the creation of a Kurdistan in Syria, Salih Muslim encountered great dificulty in mobilising combatants. The young Kurds who had found refuge in Iraq refused en masse to participate in the colonial project . Salih Muslim was once again in Paris on Friday the 27th November. The Russian military intervention, on the 1st October 2015, upset the plans of the colonial powers. For President Recep Tayyip Erdoğan, it once again pushed back the implementation of the Juppé Plan and his dream of the purification of Turkey. Consequently he gave orders to his army to prepare an incident with a Russian plane, as the whistle-blower Fuat Avni noted at the time. On the 16th November, Russia extended its military operation against the terrrorist groups in Syria by attacking, politically, their sources of finance. President Vladimir Putin provoked astonishment at the G20 meeting in Antalya by accusing, without naming him, the President of the session, Recep Tayyip Erdoğan. He showed the diplomats present satellite photographs of convoys of tanker-trucks travelling from locations in Syria to Turkish ports, and denounced the laxism of those who allowed Daesh to accumulate billions of dollars by this trafficking . Over-estimating the support that he expected from Washington, or under-estimating the power of Russia, on the 24 th November, President Erdoğan ordered the detruction of a Russian Soukhoï which had entered Turkish air-space for 17 seconds . Without hesitation, Moscow reacted by imposing heavy economic sanctions against Ankara, broadcasting the radar recordings of the incident , deploying S-400 missiles, and finally, on the 2nd December, by broadcasting, during a Press conference with their Chief of Staff, the satellite photo-based proof of the responsibility of Turkey in the financing of Daesh . Immediately, the international Press, which had been denying the truth for a year, was suddenly swamped with reproaches against the autocrat of Ankara and his family. On the 29th November 2015, the European Union rolled out the red carpet for Turkey. It re-booted the negotiations for Turkey’s adhesion, freed up entry visas, and offered it 3 billion Euros. (At the podium – Turkish Prime Minister Ahmet Davutoğlu, President of the European Council Donald Tusk, and the President of the Commission, Jean-Claude Juncker).